Nothing comforts you from coming home from a long, perfect, relaxing vacation at the beach like a mountain of carbs with pieces of bacon smiling at you from the crevices. See how happy it is? I, unlike this beaming bacon, am quite unhappy. I have the post-vacation blues. Can I please go back? Right now? Can I stay forever? Please? Well then. I'll just have to eat some potatoes. 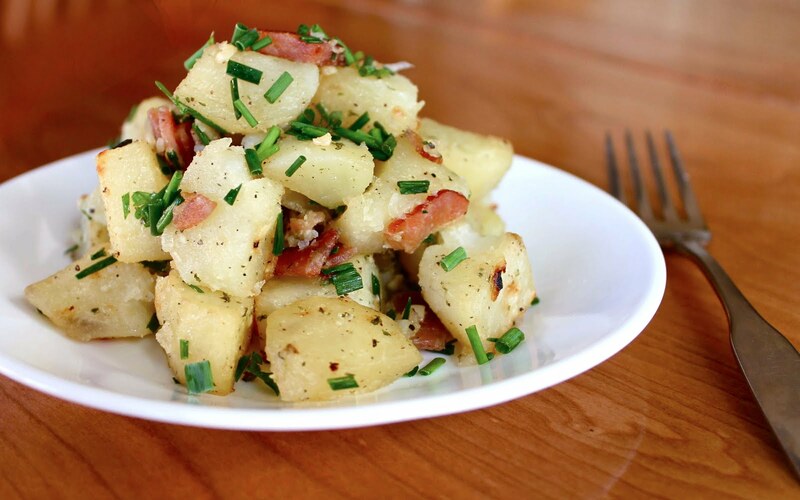 Toss together the potatoes, bacon, garlic, onion, ranch dressing mix, olive oil, and some salt and pepper. Spread onto a baking sheet lined with tin foil. Bake at 400º for about an hour, stirring about every 15 minutes. At the end, broil it for a few minutes until the tips of some of the potatoes are lightly browned. Garnish with chives and parsley.